Is your photo of reasonably high resolution? Does your photo have light and darker areas? The subject isn't squinting in the photo? Can you see a gleam in the subjects eyes? Can you see the colour of the subjects eyes? If you can say yes to most of these then you have a photo good enough to send. The better the photo – the better the portrait of your pet will be. 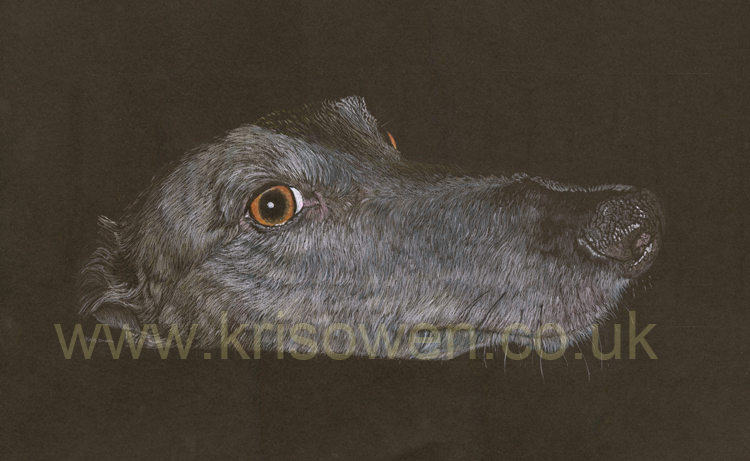 Please contact me by email or telephone, and advise how many dogs and what size of portrait you would like. Once I have your photo – your portrait will be started. Once completed – I will email a photo of the completed picture to you. If you wish to buy the picture, you can then send your payment and your picture will be posted. If you are not completely satisfied upon receipt however, you can return your picture for a no-quibble refund. My aim is to have happy customers who love the pictures I create.